Nerve starring Emma Roberts and Dave Franco is in theaters now! Take a look at our review for the film and then at the awesome giveaway from Lionsgate! 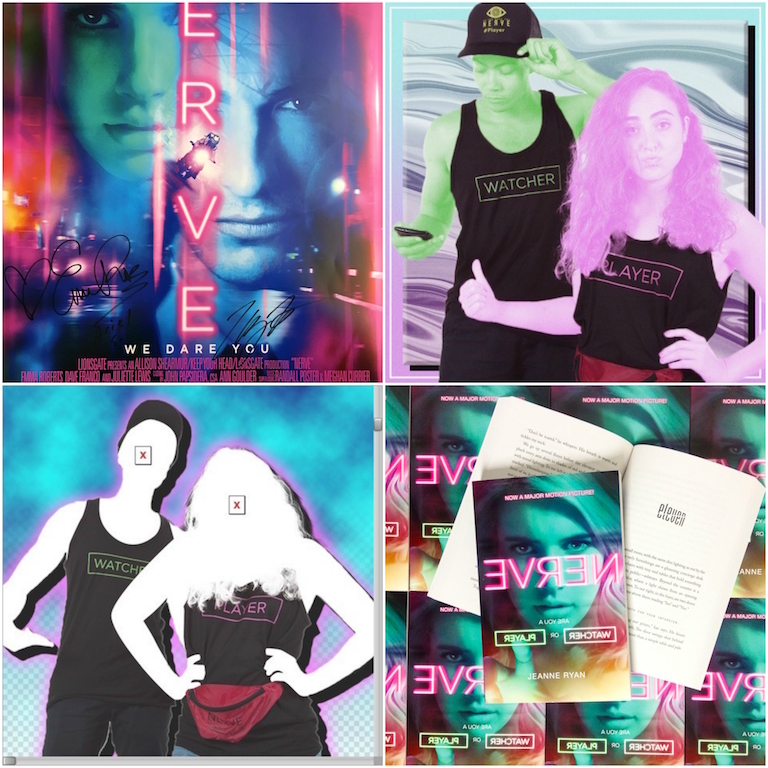 I jumped at the opportunity to attend a screening of Nerve before its official release. This movie has had me excited since I saw the first trailer! I can tell you that it didn’t disappoint at all, and I recommend seeing this one in theaters. It will leave you on the edge of your seat! It’s a simple question that takes on a very complicated meaning in Nerve. This movie balances suspense, humor, and a relevant social message all in relative short ninety-six minute run time. Nerve is an online game where you can either watch players (on your phone, computer, or tablet) compete for money, or you can be a player and you receive money by completing dares. As you move up levels and your watcher count increases, you get more difficult dares that earn you more money. Think of it as Periscope mixed with some serious Anonymous style hacking abilities. Once you create a profile, the program automatically compiles information from all social media sites to tailor the dares for you. It even hacks into your bank account to directly deposit the money you win. The only way out of playing is to bail, which is to refuse a challenge, or fail, which means you attempted the challenge but didn’t complete it. If either of these two things happens, the player loses all the money they’ve made so far. Eventually, the two players with the most people watching them go to a final round for a face-off. The film stars Dave Franco and Emma Roberts as two players, Ian and Vee. Ian is in it to win it and Vee started Nerve on a dare because one of her friends told her she was too safe. Of course, the watchers end up pairing them together because, let’s be honest, their chemistry is amazing, and who wouldn’t want to watch them complete dares together? I mean, c’mon! As the night progresses, though, it becomes more apparent that Nerve isn’t really the simple game Vee thought it was. The danger is real, and the watchers have a lot of control when it comes to the game. The film follows not only Ian and Vee’s dares, but we get side shots of dares that other people in NYC are doing, and sometimes failing hard at. One of the most compelling things about the story to me was its take on social media and the idea of hiding behind a username. We live in a time when cyber bullying is very real and very hurtful. Trolls lurk, waiting for the right moment to pounce on someone. It’s the belief that using an avi or a username somehow negates your responsibility for the things you’re saying or the effects of the decisions you make. The watchers in this film decide dares and as the night progresses, they get increasingly more dangerous. They watch these players and the situations they’re in and actively cheer for their failure. My favorite scene came at the very end, so I won’t spoil it, but it sheds light on this phenomenon in our society of no name/no accountability for online actions, and is a brutal wake up call for the watchers. I thought this film was brilliantly paced, the cast was on point, including the supporting characters. If they told me there would be a Nerve 2 with Emma and Dave again, I’d be in that theater in a heartbeat. As it stands now, I’m going to grab it up as soon as it’s released on Blu-Ray/DVD.